Michael McFadyen's Scuba Diving - Colorado Pass and Drift Fish Rock off South West Rocks is usually home to a constant current from the north. It is not all that often that the current dies off completely or drops to a reasonable level so that you can dive certain areas. These include The Pinnacle, the western side of Fish Rock, the area in front of the shallow entrance of Fish Rock Cave and the eastern side of the rock. 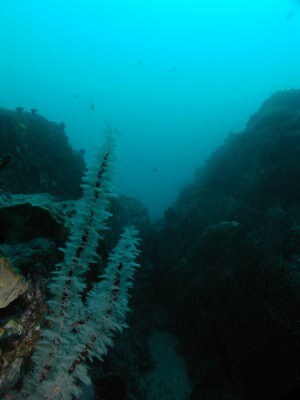 One of NSW's best dives is the eastern side of Fish Rock Cave. This site is not dived all that often as Fish Rock is normally prone to being affected by strong currents from the north. I estimate that about 80% of the time this current is too strong to permit any diving in this area. For 10% of the remaining time you can do normal dives here and the other 10% there is still a current, but it is not that strong that you cannot do the dive as a drift. The current can come and go quickly, so just because there was a raging current one day, it is still possible that the next day the current will drop totally or to a level that makes a dive manageable. If the current is less than 1.5 knots (and this is pretty fast), you may be able to do this dive if you are quite experienced. You enter the water north of The Pinnacle. The aim is to head around The Pinnacle and through Colorado Pass (the area between the island and the rocks on the eastern side) and around the south-eastern corner of the island into the protected southern side near the Deep Entrance to Fish Rock Cave and the Shark Gutters. The dive boat drops you off and then follows as you move to the southern end. Once in the water, descend to the bottom. If you are on the northern side of The Pinnacle, head around it, preferably on the eastern side. Behind here you will see that the sand is about 30 metres deep here and it is about 20 metres across to the shallower start to Colorado Pass. By now you should be under the influence of the current and drifting to the south. You will probably see grey nurse sharks over the sand. Up over the reef you will go and there should be encounter enormous schools of luderick, silver sweep and silver drummer. There are a couple of gutters running north-south and another large sandy area. The depth is 20 to 24 metres. There are lots of large boulders and behind some you can sometimes get out of the current. There are normally lots of grey nurse sharks in these areas. You will be getting a bit deeper and see things like blackcoral trees and probably more grey nurse sharks. 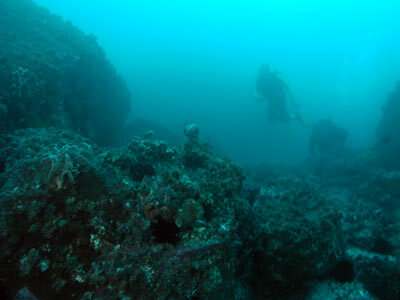 The depth will increase to 30 metres and the edge of the reef drops away to over 37 metres. Try not to go this deep, keep to a maximum of about 30 metres, even 27 if you can (since you will run out of bottom time very quickly). The turning point is the ridge that comes down from the northern side of the Deep Entrance. This is very obvious and you cannot really miss it. You do not need to go up higher than 27 metres to go over the ridge. Depending on the strength of the current, it may be as little as 15 minutes to about 22 minutes till you get to the corner. As the shear vertical point approaches you swim quickly to your right and soon you will be totally out of the current. This ridge runs back towards the cave. As you go, start ascending along the wall as you will be nearly out of bottom time. There are huge fish schools in this area and probably more sharks. If you have sufficient air and bottom time, go over to the Shark Gutters and yet more sharks and fish. Ascend up to five metres to do a safety stop on the side of Fish Rock. What a fantastic dive. I have done this dive four or five times now and they are probably the best I have done at Fish Rock out of the more than 100 dives I have done in this area. A dive only for more experienced divers due to the potential depth and the current. This dive can also be done without drifting. In no current conditions (not all that common), you can get dropped off in the corner of the Pass and then ascend in the same spot at the end of the dive and be picked up by the waiting boat. Excellent! In June 1999 I dived in this area again and we saw more than 10 grey nurse sharks, including one with both dorsal fins and both pectrel fins missing. These have been obviously removed by professional fishermen!!!! Despite this handicap, the shark appeared healthy and swam okay, if somewhat ackwardly. In July 2006 we did it and saw about 15 sharks. Have a look at the South West Rock Dive Centre's Web Site for more information on how to dive Fish Rock.